It’s been a while since I updated. Time to dust off the blog! Things have been moving along great for the documentary as we enter the final stretch of major filming for this year. I’ve met more incredible people, and caught up with some familiar faces. I’ve also discovered that there is a metric ton of drama in the paranormal community. I was swept up in one of the currents shortly after the GHOULA event at the Aztec Bar. That night I met a couple members of BHPP, or the “Boyle Heights Paranormal Project”, and I also met former members of that group. One particular member was about to start her own para-group, and asked if I wanted to include them in the documentary. I thought it would be an excellent opportunity to capture the formation of a new group, and immediately said yes. This person introduced me to some of the ex BHPP members, who were going to join her group, who also wanted to speak about why they left BHPP. One was a very young kid, probably not even 20 years old, who introduced himself as the new group’s demonologist. I’m pretty new to the paranormal field, but I have done a bit of homework. It surprised me that someone who didn’t look old enough to shave would label himself a demonologist. That whole matter fell through due to an influx of drama, which I decided not to escalate even after a threatening phone call. While that negative experience was unfortunate, the groups and people I’ve met since then have been terrific. In August, Scott Gruenwald of the internet TV show “The Paranormal STU” threw a paranormal convention called “STU-Con” in Porterville CA. It was almost a parody of an actual high priced paranormal convention. Scott charged $2.00 for the convention, and $.50 cents for the paranormal investigation! However the attendance was through the roof, and people had as good a time or better that I’ve seen at more expensive gatherings. What may have started out as a joke instead proved that a paranormal convention doesn’t need to cost the attendee an arm and a leg. This one was held at a paranormal hotspot (“The Barn Theater”), and included some high profile guests in the paranormal field, like Syd Schultz and Rex Williams. 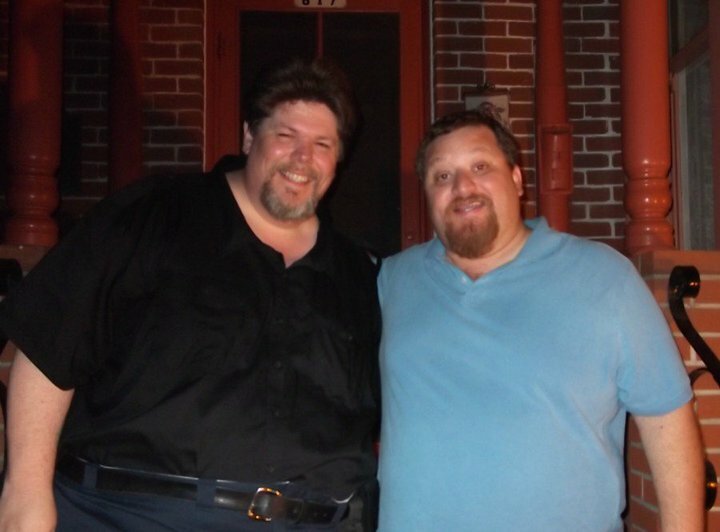 The night before the convention, I met 3am Paranormal and Louis Gonsales at the front of the Barn Theater for an impromptu I.T.C. session. Very cool! At STU-Con, I met Boyle Heights Paranormal Project founder Richard “Standing Bear” Berni. I asked about setting up a future profile of BHPP for the documentary, and Richard agreed that we’d make that happen. He also told me a few quick tales of the drama BHPP has weathered, which sounded like the other side of the story of what I heard at the Aztec Bar. A full interview will be very enlightening I’m sure. In June, BHPP had taken over as stewards of Linda Vista hospital, which caused a bit of concern in the paranormal community at first. Some felt one particular group being associated with one of L.A.’s most haunted location was unfair, but the BHPP crew have provided much better security for the location that was absent before. Many times, paranormal groups would pay good money for exclusive access to investigate the hospital, only to find that the former security at the location would allow unauthorized persons to wander into the hospital at their whim. I met the Porterville Ghost Society while I was there. A very friendly group, who took me on an exclusive tour of the Zalud House. I really have to thank Louis Gonsales for setting that up for me on my last night in Porterville! The house has a very rich history, and it is reportedly haunted by the former owners. PGS members Kathy Guinn and Bruno Huerta are very knowledgeable about the house, and enjoyed sharing tales of their ghostly encounters there. In October, Jessica from the So Cal Ghost Crew hosted a bigger paranormal convention at the Los Angeles Convention Center, So Cal Para-Con. I interviewed Jessica briefly before STU-Con, as she reformed her paranormal team. It was held in a Denny’s with very loud muzak, so I’ll have to see how much can be salvaged from that! The Para-Con was ok, with Scott Gruenwald as the emcee. Jessica put together a very professional gathering, which I understand was her first, and did a great job. BHPP I understand helped out enormously with making the convention run smoothly. High profile paranormal community members attended, including David Harvey, Christopher Saint Booth, and Rex Williams. Both Booth and Williams were slated to lead a paranormal investigation into Linda Vista hospital. Unfortunately, both were no-shows, which was disappointing to me, since they were the sole reason I bought the investigation part of the ticket. I didn’t know it at the time, but a skeptic group also attended So Cal Para-Con. Afterward they wrote a couple of very scathing blogs about the convention, one from Skepticblog, and another from the Monterey County Skeptics. I’m currently trying to set up an interview with them for the documentary. Being a skeptic myself, the tone of their blogs is something I’d like clarification on. I’ll be entering the last month of filming soon. Hope I’ll have enough footage to put together a documentary people will enjoy watching!